Canada: In the past year, tens of thousands of people have entered Canada from the US on foot, seeking a safe haven. Every day more people are arriving. This phenomenon is often referred to Trump, but it must be understood in the global context: worldwide, more than 21 million people have been forced to leave their homes because of wars, political oppression, military violence, extractivism, climate change, etc. – conditions created by imperialist states like Canada and the United States. Although directly involved in the economic and social devastation in countries throughout the Middle East, Latin America, Caribbean, Africa, and Asia, the Canadian state presumes to limit who can enter and who can legally stay.Rejecting the racist and islamophobic mainstream narrative and media coverage around those migrating, Solidarity Across Borders calls for open borders, radical solidarity with and mutual aid among migrants, solidarity cities, an end to deportation, immigration detention and double punishment, and an inclusive and ongoing regularization process (Status For All, now!). Originally published by Solidarity Across Borders. Borders play a crucial role in the capitalist system and its “migrant crisis”. Canada and the US are founded on the theft of Indigenous lands and the ongoing genocide and displacement of Indigenous peoples. These borders originally established by colonial wars, to benefit European colonizers, are also a means to control migration. They prevent people from leaving violence, poverty and exploitation, drive families from country to country, force them to board dangerous boats, and make long treks across deserts and snow. Borders push people into precarity without legal status, criminalizing them. Borders keep the global apartheid system in place. Refugees coming from the US to Quebec and Canada have had no choice but to cross irregularly at Roxham Road and other ad hoc points of entry since the Safe Third Country Agreement came into effect in 2004. This agreement between Canada and the USA prevents migrants from making refugee claims at a regular Canadian border post if they come from the USA (and vice versa). This means migrants entering Canada from the US can only make a refugee claim if they first cross “irregularly.” This policy has already taken the lives of migrants – we honour the memory of Mavis Otuteye who died in June 2017 – and caused others to lose legal status or be deported. Those who arrive in Canada are encouraged to put their efforts and hopes into their individual cases: trying to prove that they are “real refugees” or “good immigrants.” This lengthy bureaucratic fight is isolating and takes energy away from collective struggle. Moreover, in the past few years, on average, 40% of inland refugee claims were refused. There may be an even higher rate of refusal for people crossing irregularly because many have little support in making their claims and because some have been outside their country of citizenship for many years. Soon, many will be refused as refugees and face a choice: stay in Canada without papers or be deported to their country of citizenship. The Canadian refugee system will thus smoothly deal with “the problem” outside the media spotlight: judge people individually, and then, quietly, one by one, deport or criminalize many thousands. Mainstream discourse and media coverage feed divisions among social groups who should be allied against the unjust global distribution of wealth and power. At best presenting the issue as humanitarian rather than political, mainstream discourse hides the role that borders play in maintaining that unequal distribution. The way that Canada has contributed to pushing people out of their homes in the first place is never mentioned. The far-right discourses of groups such as La Meute and Storm Alliance are emboldened by the normalization of Islamophobic and racist attitudes by mainstream media, politicians, and the state. By declaring that they are only against “illegal immigrants,” these far right groups attempt to convince others that migrants crossing irregularly are ‘criminals’. Playing into long-held racist/islamophobic European fears of black and brown men, far right groups across Europe, the US, Canada and Quebec spread confusion and fear about an “invasion” and “terrorists” and encourage the state to expand border enforcement and the policing of migrants. In these ways, instead of the conflict being defined by a division between wealthy/powerful and poor/oppressed both inside and outside Quebec and Canada, it is defined by a division between people inside Quebec or Canada (fighting to keep social programmes (but only for “us”), upholders of ‘our’ values etc.) and people outside/newly arriving (portrayed as competitors for scarce resources, “queue-jumpers”, security-threats, etc.). WE SUPPORT THE FREEDOM OF ALL MIGRANTS TO STAY, TO MOVE, TO RETURN. SPECIFICALLY, WE SUPPORT MIGRANTS IN THE UNITED STATES WHETHER THEY CHOSE TO FIGHT TO STAY IN THE US OR TO CROSS ANY WAY THEY CAN INTO CANADA. IN THE FACE OF THE CASE-BY-CASE APPROACH IMPOSED BY THE STATE, WE MUST TAKE COLLECTIVE ACTION AND SUPPORT EACH OTHER. AS WE OPPOSE ANTI-MIGRANT PROPAGANDA AND THESE FABRICATED DIVISIONS, WE MUST BUILD CONCRETE SOLIDARITY. – Challenge the government (with public campaigns, forums, in media, etc.) about its Safe Third Country policy. 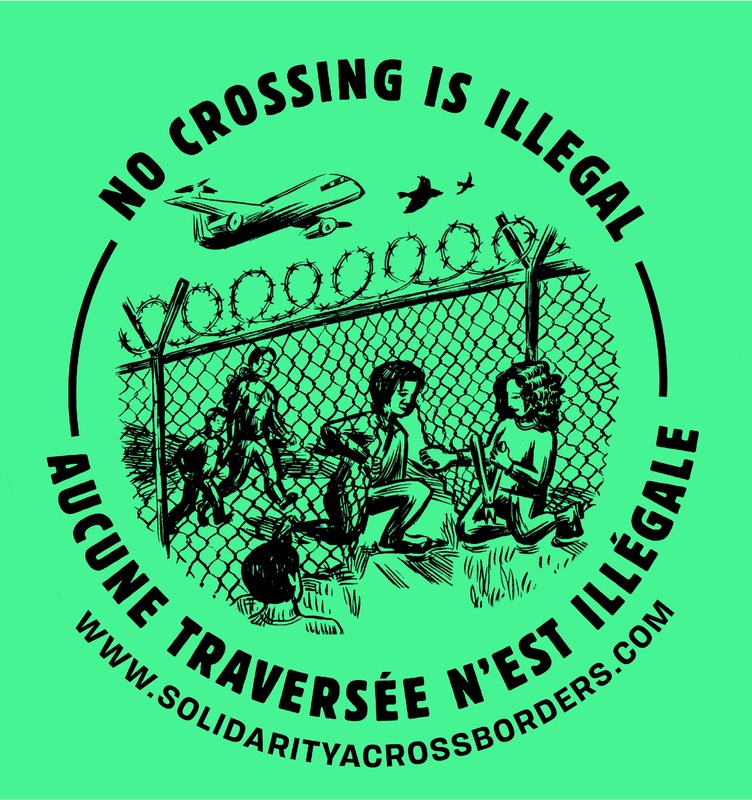 – Service organizations: join your local sanctuary/solidarity city campaign to offer services to all regardless of status and to never allow CBSA access (in Montreal, sign on to Solidarity Across Borders Solidarity City statement here: http://bit.ly/2lFerMi). – Explore areas along the border and help set up the infrastructure to support people to cross safely and freely. – Join the Anti-Border Caravan being organized by Solidarity Across Borders from 29 June to 1 July (details will be posted on the Solidarity Across Borders facebook page and website). – Offer time to groups giving frontline support to people coming across the border and make sure that those groups treat refugees arriving with human dignity and offer them the legal and daily support they need. – support mobilizations creating a Solidarity City including campaigns around access to health care, housing, shelter, education, food (get in touch with Solidarity Across Borders); join efforts demanding that Mayor Plante come through on Coderre’s completely unfulfilled promise to make Montreal a sanctuary city by ending all SPVM/CBSA cooperation. In general, we call for effective, non-hierarchical, and inclusive grassroots organizing, based on mutual aid and radical solidarity, using a diversity of tactics and direct action, to strengthen community resistance to border controls in our cities, fight deportations and detentions, defeat the fascist movement, and actively support anti-colonial struggles and indigenous sovereignty.